Whenever I get stressed out at work, especially at the point of almost or really getting burned out, I always think about going on a vacation somewhere. Since I love the beach, my idea of a holiday is taking off on an island paradise getaway. Just you, the beach, sand, sun and maybe underwater encounters with Nemo and the rest of the gang. When a friend of mine returned from vacation, looking relaxed and tanned, I felt jealous. More so when she told me where she had to–Coron Island in Palawan, Philippines. When you think of the distance, it seems like an awfully long–and far– trip to take for a vacation. But when I saw the gorgeous pictures she had taken, I knew then that Coron Island would now be part of my personal travel bucket list for island getaways. Where in the World is Coron? With tropical islands like Maldives, and the Caribbean, to name a few, it probably won’t be a surprise if people don’t know about Coron, Palawan. Is Coron where the underground river located? The answer is no. Coron is a municipality of Palawan just as El Nido is. You would have to access a completely different airport in Busuanga Island in order to get to Coron. The underground river also known as the Puerto Princesa Subterranean River National Park or Puerto Princesa Underground River for short, is found in Puerto Princesa, the capital city of Palawan Island. Coron, however, is not without its charms. In fact, Coron Island has been included in the top 10 best sites for scuba diving in a list compiled by Forbes Traveler Magazine. What to Do in Coron? Coron Island is a diver’s paradise. If you are an avid scuba diver then you would know that this is one of the best places where you can see Japanese WWII shipwrecks scattered all over the area. Swimming from bow to stern, you can see all sorts of wonderful sea life like vibrantly colored schools of fish and corals that have grown among the wreckage. If you have a vivid imagination and a superstitious fear of sunken vessels, you can explore less scary options like underwater caverns or coral gardens. Even if you can’t scuba dive, the snorkeling itself is still an amazing experience you shouldn’t miss! 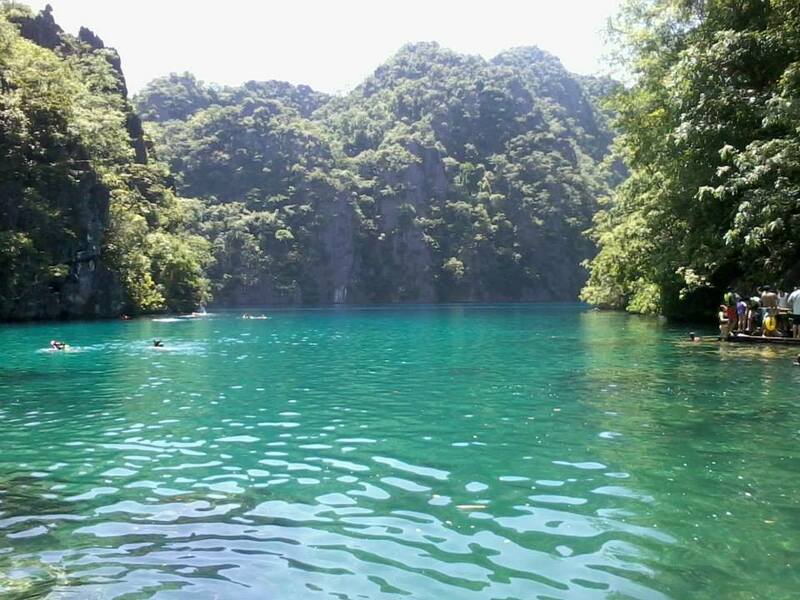 Coron is home not only to the best diving sites but also white sand beaches, wonderful lagoons and lakes. Of its seven lakes, only two are open to the public, which are the Kayangan Lake and the Barracuda Lake. The former has won the distinction of being the cleanest lake in the Philippines for three consecutive years. To get to Kayangan Lake, you have to climb 50 steps to get a scenic view of the cove before descending to the lake. To get to Barracuda Lake, first you must take a 20-minute boat ride from Coron and then you need to trek up a limestone wall, which is around 25-meters tall. It can be tricky navigating over the rough terrain so be very careful in climbing. Aside from the lakes and lagoons, you can trek up 700+ steps to Mount Tapyas where you can see the town of Coron and the many islands and islets surrounding it. It is more ideal to climb during the late afternoon so you can catch the spectacular sunset there. To soothe tired muscles after your trek, enjoy a relaxing dip in Maquinit Hot Springs. Don’t make the mistake of jumping into it though because the scalding temperature will make you feel as if you are being boiled alive. Instead, dip into the pool slowly, beginning with your feet until your body parts gradually adjust to the temperature. When this happens, the heat becomes a soothing balm to all the sores and aches you got from your trek. Since Coron Island may be far from where you are based, it is a good idea to take travel insurance with you just as a backup for situations like delayed or cancelled flights. This is just a necessary precaution that you should take not only on island getaways but on every trip you take.